Former Arkansas governor and current GOP presidential wannabe Mike Huckabee never met a quack product he wasn’t willing to sell (and we’re not even counting his old Fox News panderama). 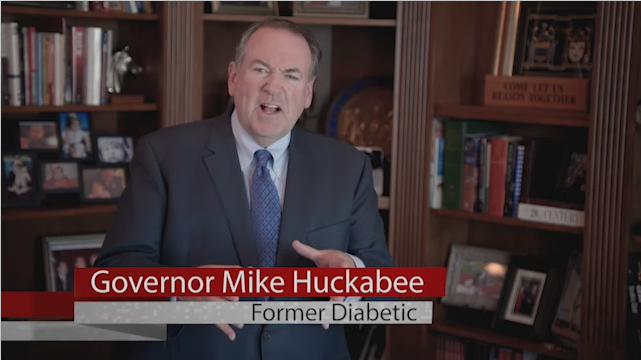 Start with his shilling for a dubious diabetes treatment. He cuts ties with a company as he weighs a presidential campaign. Not long after leaving his Fox News show to explore a presidential run, Republican Mike Huckabee has cut ties to a company for whom he promoted a cinnamon-linked diabetes treatment, a spokeswoman tells the New York Times. Or actually reverse Huckabee’s political fortunes. But wait! There’s more! A new pitch from Mr. Hackabee for an outfit called Food4Patriots! Our question: Is there anything Mike Hawkabee will not sell? This entry was posted in Uncategorized and tagged Biblical cancer cure, Bloomberg News, Diabetes reversed, Fox News, Mike Hackabee, Mike Hawkabee, Mike Huckabee, Mike Hucksterbee, MSNBC First Read, New York Times, panderama, Patriots4Food, survival food. Bookmark the permalink.